Last week I started this little series of posts called ‘Personal Craft Projects’, where I will share my current personal Christmas and New Year related craft and DIY projects for my wee girls and me. 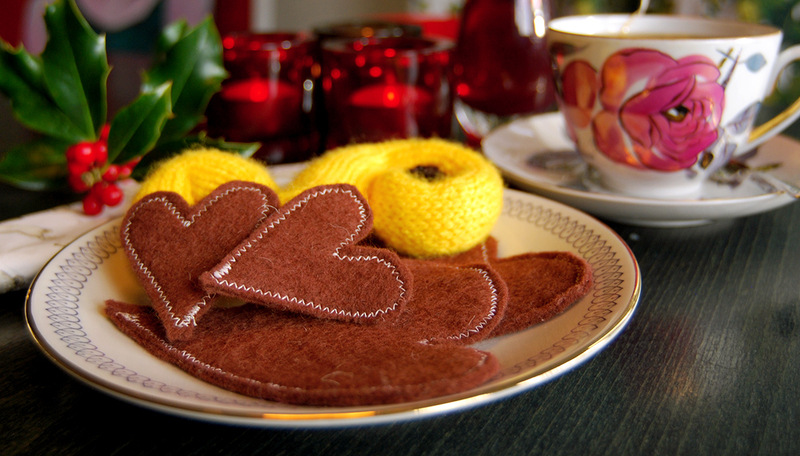 Last week I showed you how to knit this little saffron flavoured goodie and this week I thought I show you how to make a really quick and easy co-partner to go with your knitted Lussebulle – a felted gingerbread biscuit with icy frosting. Another favourite of mine when it comes to the Swedish Christmas treats. I used two layers of 1mm, brown craft felt. If you are using thicker felt, then one layer might be enough. All depending how stiff and thick you want your biscuits. Mine is quite soft, which I thought was rather nice. Start with drawing the shape of your gingerbread biscuit onto the brown felted fabric. When you are happy with the shapes, lay the second layer of felt under the one you draw on (with the drawn lines facing up) and pin them together. Then cut out the shapes (cutting through both layers of felt) with a pair of scissor. Next, sick-sack the icy frosting using white thread in your sewing machine. Sick-sack the stitching approx. 5mm from the edge of the gingerbread biscuit, so there is spacing between the seam and the edge. The stitch also attaches the two layers of felt together. A tip is to have a quite tight and short stitch for the sick-sack setting. That makes a neater end result, with more icy impact. Don’t backstitch when starting, but rather only backstitch in the end, over the area where you started sick sacking. That makes fewer thicker patches in the stitched line.